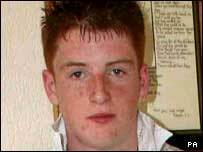 The mother of a 15-year-old boy murdered in a gang attack in County Antrim has paid tribute to her son. Michael McIlveen, a Catholic, died in hospital on Monday evening after being beaten with a baseball bat in an alley in Ballymena, on Sunday. His mother, Gina, said her son was "popular" with Catholic and Protestant friends: "I just can't understand this at all - he didn't deserve it." Four men and a juvenile are still being questioned about the sectarian assault. Earlier on Tuesday, Michael's uncle, Francis McIlveen, told the BBC's Nolan programme the family wanted to make sure nothing like that ever happened again. "The family's distraught at the minute, so they are," he said. 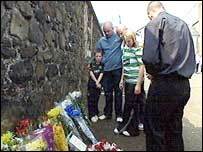 "They just can't believe it that wee Michael's gone, a wee child, 15-years-of-age, lying in that bed, dead." 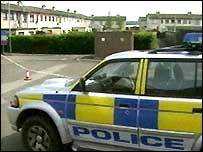 The teenager, from the Dunvale area of Ballymena, was attacked after buying a pizza on Sunday. He had been on a life support machine at Antrim Area Hospital where his family had been at his bedside. "I think now's the time, if any time, in the memory of Michael McIlveen to put an end to sectarianism." Michael was a pupil at St Patrick's College in Ballymena which held a special assembly on Tuesday morning. School principal Kate Magee said everyone was shocked by the death of Michael who, she said, had been very popular. "We feel very much his loss," she said. "We are supporting one another. It is very much a whole community effort to try to support the young people." Young people have been holding vigils in the teenager's memory and flowers are being laid at the spot where he was attacked. Superintendent Terry Shevlin, who has pointed to a sectarian motive for the attack, said he there was a lot of emotion and anger at the murder. "There's maybe a turning point within Ballymena - that not just young people but adults, who at times behind the scenes would orchestrate young people to get involved in sectarianism, I think now's the time, if any time, in the memory of Michael McIlveen, to put an end to that." Democratic Unionist Party leader Ian Paisley, who is the local MP, said: "As we move towards the marching season, I would appeal for calm." He added: "I would call on all sides to pull back from the brink before tragedy is multiplied by catastrophe." Ulster Unionist Party leader Sir Reg Empey said the killing "illustrates the distance we have still to travel as a society to what could be described as normality". The Orange Order said in a statement that "no claim to political loyalty or religious affiliation can possibly justify such a reprehensible and wicked crime". Sinn Fein leader Gerry Adams said political leaders needed to work to "eradicate deep rooted sectarianism and discrimination wherever it exists". Northern Ireland Secretary Peter Hain said it was a "sickening sectarian attack" which dragged Northern Ireland "back to the dark days of the past". Shadow Northern Ireland Secretary David Lidington said "such naked sectarianism and savagery can have no place in any civilised society". Irish Prime Minister Bertie Ahern said the killing was a "shocking reminder of the evils of sectarianism". Meanwhile, since the death of the youth, a large number of postings have been made about the killing on a website chat room used by young people. Many make accusations against others in the town over the death. A police spokesman said they were aware of the website and were monitoring it. # posted by SAOIRSE32 : 9:25 p.m.